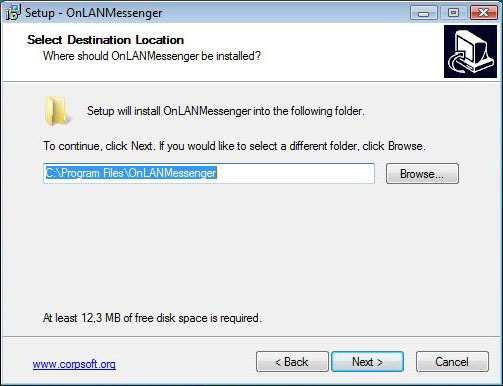 This manual will help you install, set up, and launch OnLAN Messenger enterprise messaging service fast and simple. Follow the instructions accurately. Everything is going to be easy. 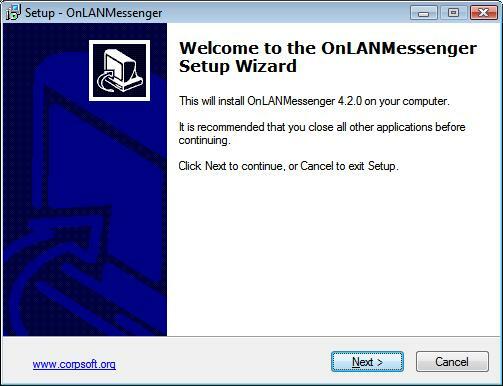 After the download has finished, start the installation by launching OnLANSetup program and following the wizard’s instructions. Begin the installation by clicking on “Next” button. Go to License agreement. Read the License Agreement carefully and check “I accept the agreement’s conditions.” Click on “Next” button. Choose “Install”. Click on “Next” button. Select destination location. Select a folder on your computer the program should be installed in. Click on “Next” button. Select Start menu folder. It is optional to enter a different name. Click on “Next” button. Select additional tasks. 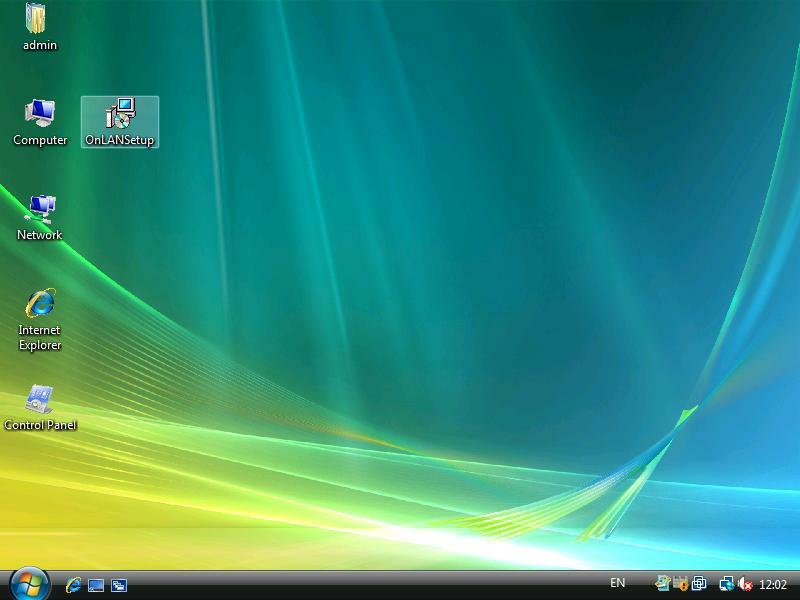 Check “Create Desktop Icon” if you want to put the program’s icon on the desktop. Click on “Next” button. Indicate the destination to your license file and the name of the person. 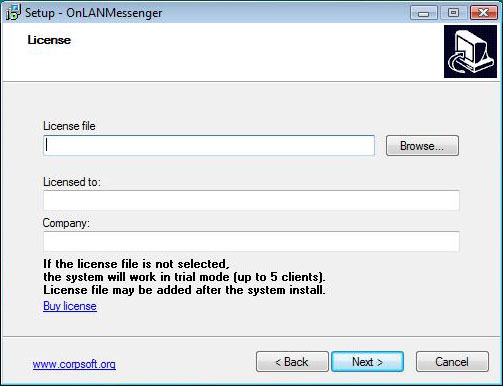 You can leave the fields blank for installing the program in trial mode (5 users’ limit). Click on “Next” button. In Database selection, indicate the destination to the existing database, create new database, use test database, or do not apply database. For trial installation, choosing test database is recommended. Click on “Next” button. In Client application startup settings, check “Share to Everyone” and “Activate ‘Guest’ Account” to simplify the access to the client application’s modules from every location of your network. Click on “Next” button. You are now ready to install. Launch the installation process. Click on “Install” button. Wait until the office messenger’s installation is completed. Then click on “Finish” button. When the setup is completed, OnLAN Messenger client application needs to be launched on end users’ workstations. 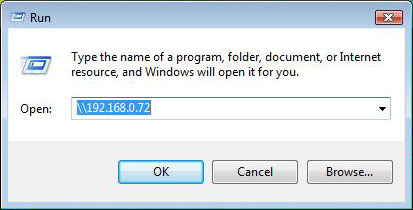 Click on Start->Run and enter your server computer’s IP address (the IP address of the computer, where the program has been installed) in the bar. Click on “OK” button. 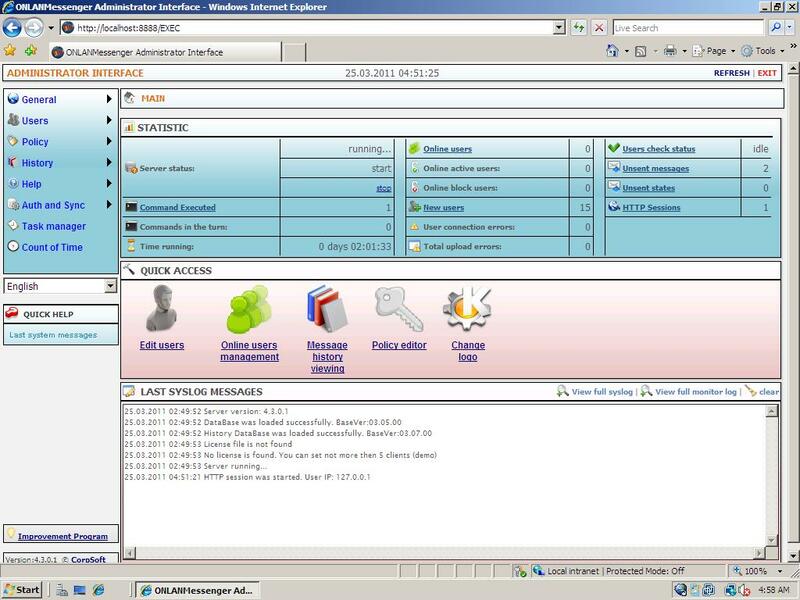 Open the shared “OnLANMessanger” folder and launch the client application. Click on «Run» button. 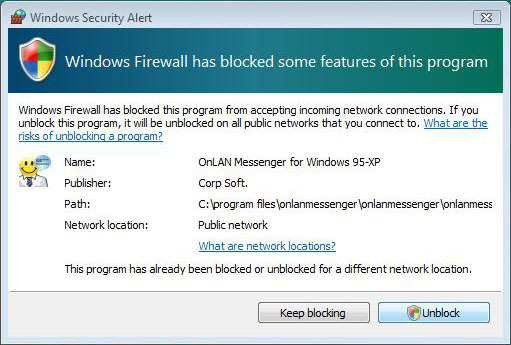 If Windows Security Alert sign appears, stating that Windows Firewall has blocked some of the program’s features, click on “Unblock” button. If Windows Security Alert sign doesn’t appear, but you face difficulties while using the program, you can turn off Windows Firewall manually by clicking on Start->Settings->Control Panel->Windows Firewall. 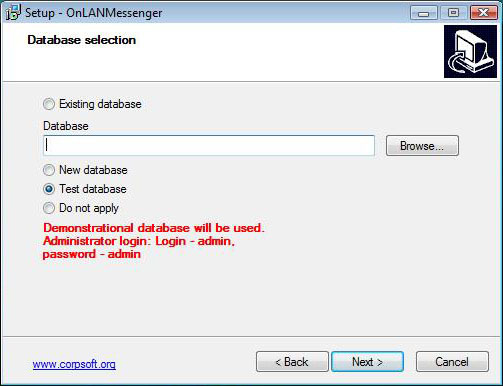 If you selected test database you can get login and password of a test user, proceed as follows: on server computer (the computer, where the program has been installed), open OnLAN Server shortcut on your computer’s desktop to enter administrator web-interface. System will log in automatically. If this hasn’t occurred, enter Login – “admin”, Password – “admin” (if your chose test database while installing the software). In Quick Access Block select Edit users. Select a test user. Remember his login and password. Go back to a user’s computer. In «server» field, enter server computer’s IP address. Enter login and password. Click on “Login” button. This instruction describes your actions while working in Command Center. 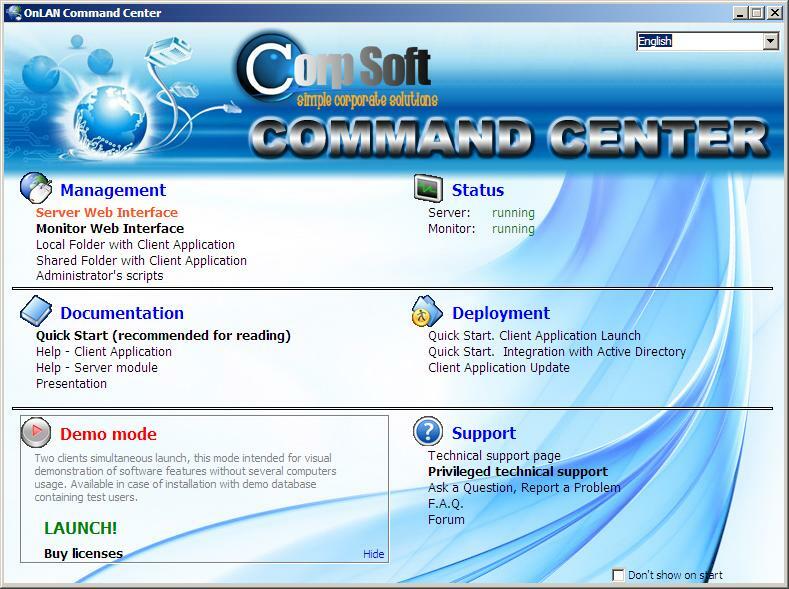 Upon the program installation, the Command Center will launch automatically. When you close the Command Center, it continues working in a minimized mode. 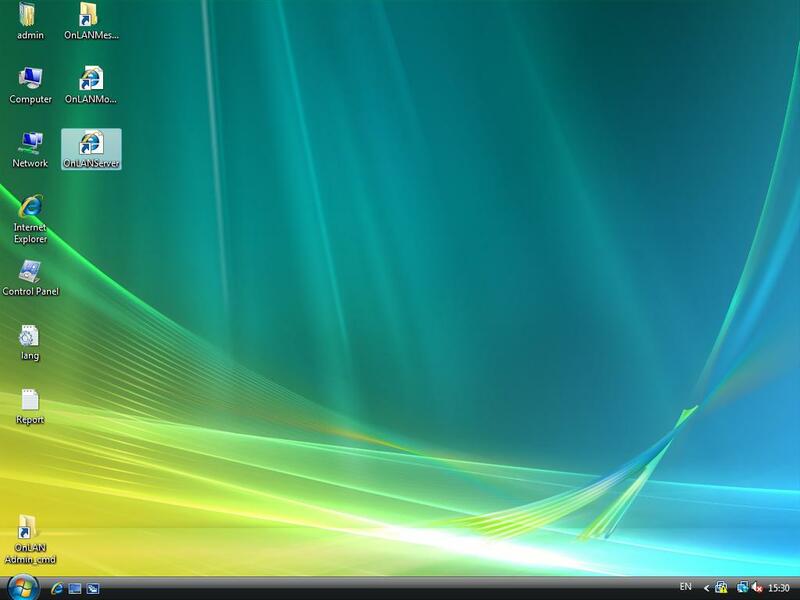 To re-open it, click twice on the icon in the system tray. 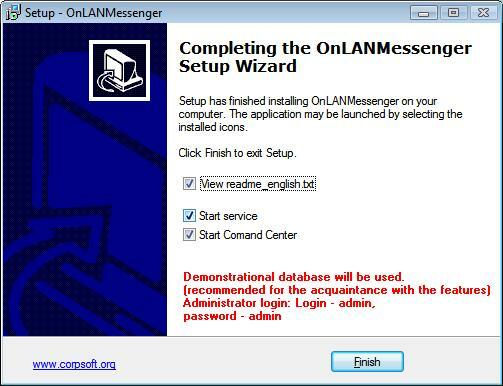 This instruction shows the easiest way for an administrator to synchronize employee database and authentication parameters of your organization with OnLAN Messenger's contact list. 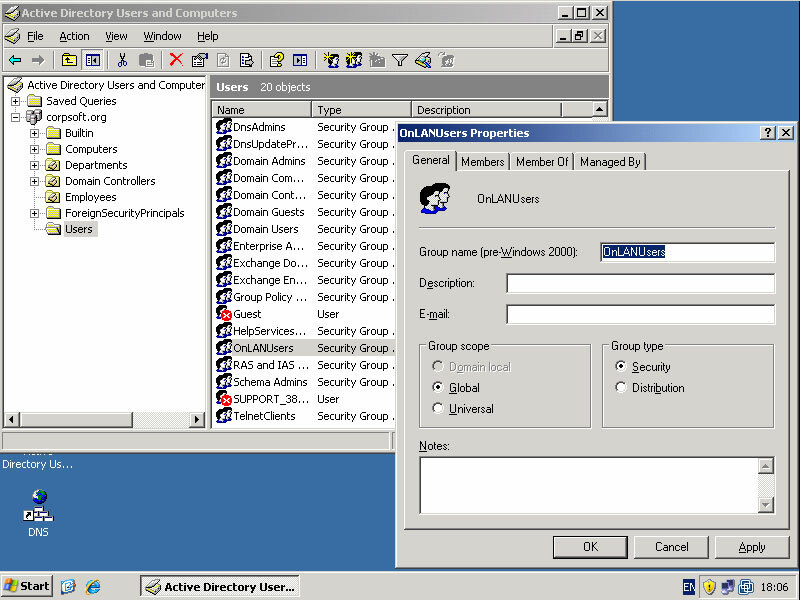 If you plan to synchronize database with Active Directory, you should preliminary create a group "OnLANUsers" in Active Directory (it must be created in system folder "Users", like on screenshot below), in which you have to include all of your company's users, for whom synchronization is necessary and who will be able to use the client application. 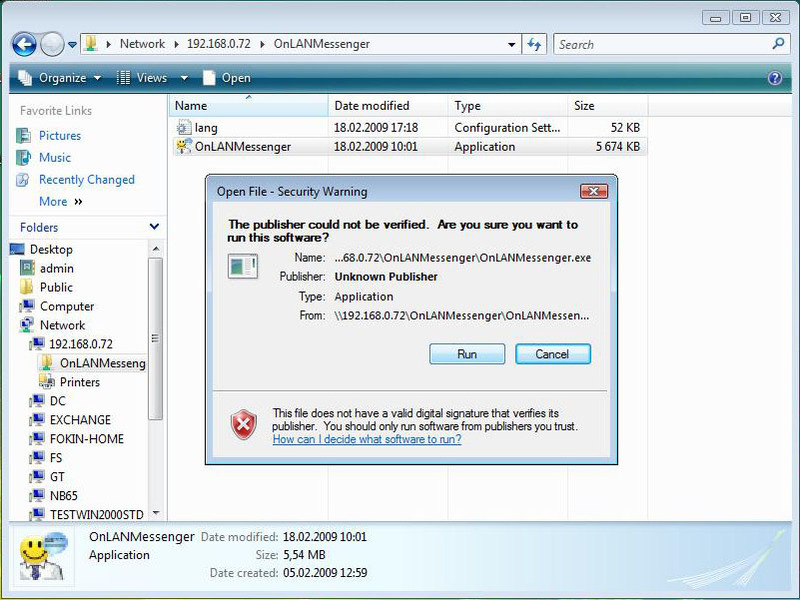 After the business messenger software installation open OnLAN Server shortcut on your computer’s desktop to enter administrator web-interface. System will log in automatically. 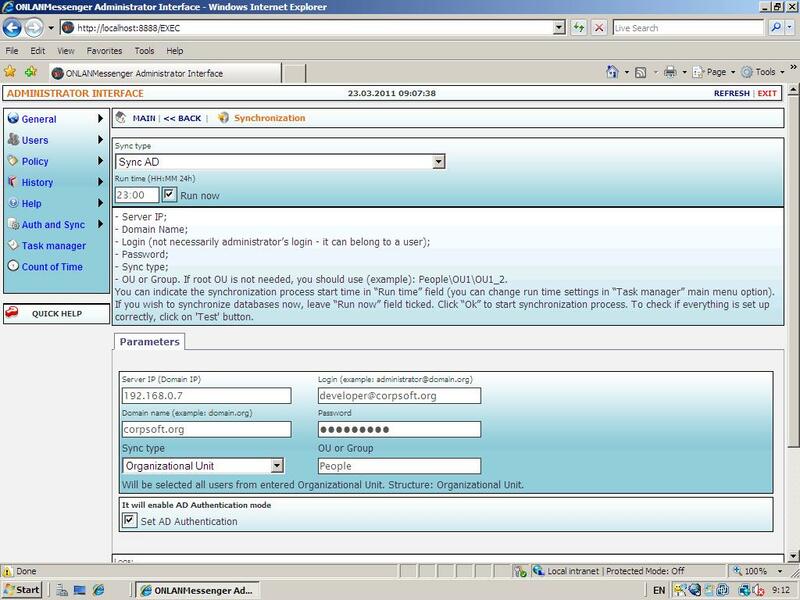 If this hasn’t occurred, enter Login – “admin”, Password – “admin” (if your chose test database while installing the enterprise messaging software). 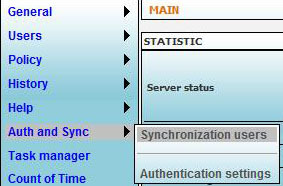 Choose “Auth and Sync”-> “Synchronization users” in web-interface’s main menu. You can indicate the synchronization process start time in “Run time” field (you can change run time settings in “Task manager” main menu option). If you wish to synchronize databases now, leave “Run now” field ticked. Click “Ok” to start synchronization process. To check if everything is set up correctly, click on “Test” button. 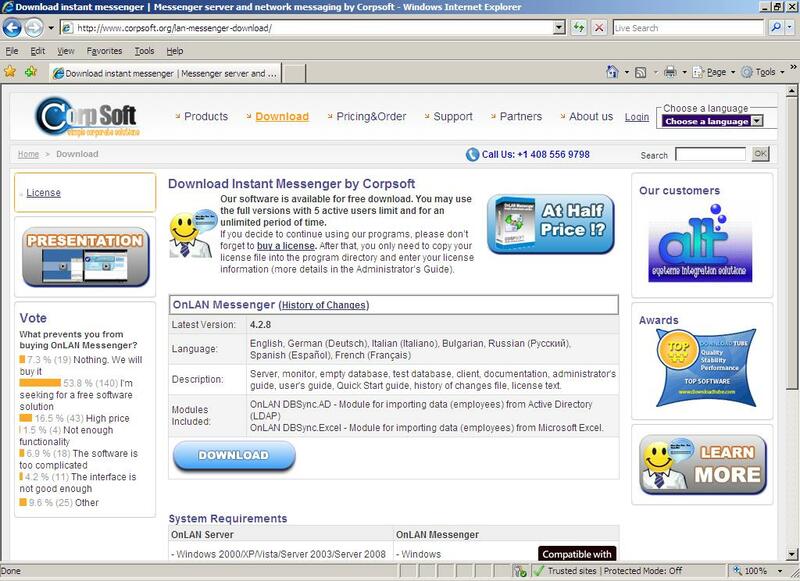 Synchronization is successfully completed, now you can view your colleagues’ names in OnLAN Messenger’s contact list. 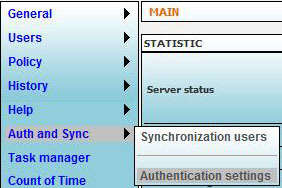 If you want to set up users’ authentication parameters choose “Auth and Sync”-> “Authentication settings” in web-interface’s main menu. 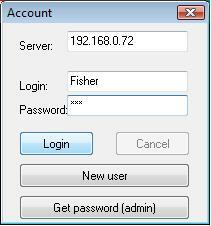 1) Internal base, if logins and passwords are stored locally. Click “OK”. 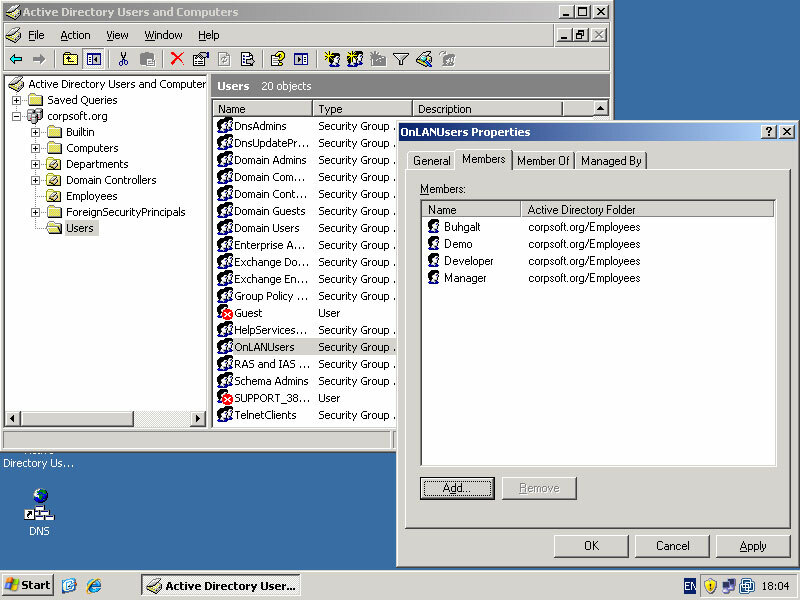 2) Active Directory, if logins and passwords are stored in AD database. 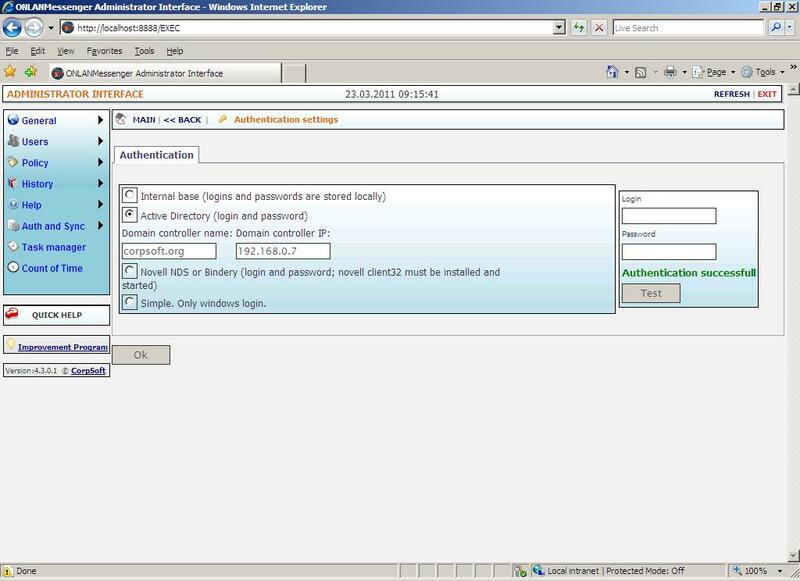 It is also necessary to enter domain controller name and domain controller IP values. Click on “Test” button and if everything has been entered correctly you will see “Authentication successful!” message. Click “OK”. 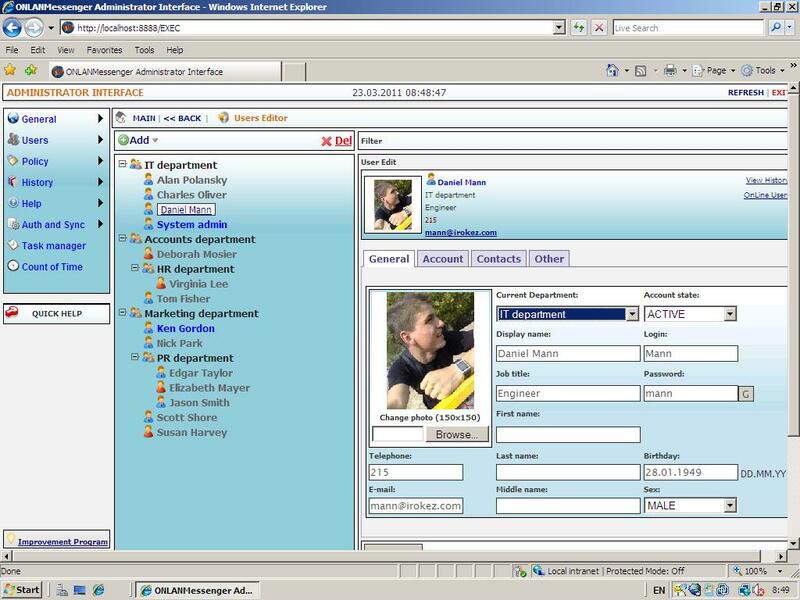 3) Novel NDS or Bindery, if novel client32 is installed and started. Click “OK”. 4) The easy one: Windows login only. Press “OK”. Enjoy secure messaging with your colleagues!